These are difficult times for companies and investors. It is becoming more and more apparent that central bank stimulus policies have failed to counter today’s demand deficit, caused by ageing populations. It is also clear that central bankers themselves have little idea of what is happening in the real economy. Both Friedman and Modigliani can be forgiven their mistakes, as there was no reliable data at the time they were working, to explain the errors in their thinking. But today’s central bankers have no such excuse. 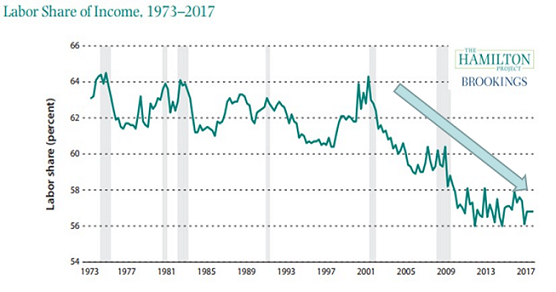 Western fertility rates have been below the replacement level of 2.1 babies/woman since 1970 – making it obvious that spending and hence economic growth would slow, and then probably decline, as the Boomers moved into retirement. And slowing demand would automatically reduce inflation, no matter what they did to the monetary supply. Investors have chosen to ignore these factors until recently. Instead they have taken advantage of the free cash available from central banks to boost the prices of financial assets – whether these were commodities such as oil and copper, or houses or stocks and shares. But all good things come to an end. And they are becoming unpleasantly aware that if central banks really don’t know what is happening in the real economy, then populist solutions provided by Donald Trump or Brexit leaders may end up causing chaos in their markets. We saw these first signs of doubts on Friday, when the major decline in US jobs growth – which fell back to 2010 levels – clearly shocked the US Federal Reserve. But far from celebrating the potential for new stimulus programmes, investors pushed US share prices down for the day. This new caution is also reflected in this month’s Boom/Gloom Index above. It has fallen back again after the euphoria that followed the Fed’s decision to back off the promised interest rate rise in March. Now, I suspect, many investors would prefer an increase to come quickly, to reassure them that recovery was still possible. It could be a long and difficult summer, particularly if the Leave campaign maintains its current opinion poll lead into the vote itself – now less than 3 weeks away. Attention is also shifting to the potential implications of a narrow Remain vote for the ruling Conservative Party. Many believe the Party could split if this occurred, such has been the bad feeling during the campaign. This could end up handing the keys for 10 Downing Street to the opposition Labour Party. After 6 years of largely-wasted stimulus efforts, the world’s economic advisory bodies are finally having to accept that ageing populations really do impact economic growth. Thus the impact of “aging” is highlighted twice in the Fund’s 35-word Summary. And the IMF then focuses on the adverse employment impact in the above 2 charts. These show a major decline underway in both the working age population (blue column) and labor force participation rates (red) in the Advanced and Emerging economies. In turn, this means the previously positive net effect (yellow line) on growth is now disappearing. Of course, this is major progress, and must be welcomed with both arms. But as with the recent Bank for International Settlement paper, “Can demography affect inflation and monetary policy?”, the IMF still holds on to the other half of the taboo – that aging does not affect demand. In many ways, this is not surprising. The world has never before had an aging population. Even as recently as 1950, most people in developed countries died fairly soon after retirement. And most people in emerging economies died before retirement. So there is no previous history for economists to model. Equally important is that most have learnt to model demand as a multiple of GDP growth. In petrochemicals, for example, ethylene growth is typically assumed to be 1x GDP. So few have seen a need to separately model demand. “Consumption is around 60% of GDP. 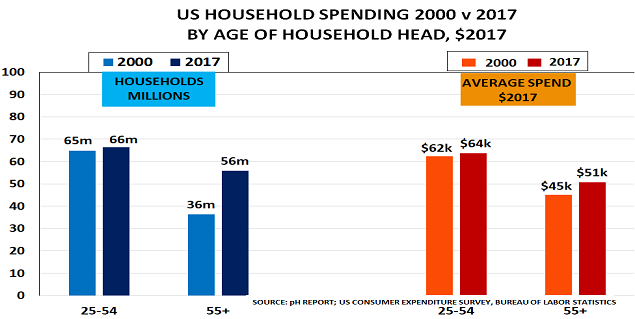 Thus the boomers created an economic supercycle as they moved into the 25-50 age group, when spending and incomes typically peak. But now the pendulum is swinging the other way. The ageing of the boomers means the majority of UK households have been headed by someone aged over 50 since 2002. Demand is, however, the key determining factor in the New Normal. Companies and investors who recognise this will have an unbeatable competitive advantage for years to come. Others will simply have to wait for the world’s advisory bodies to wake up to the other side of this ‘New Reality’. This simple bit of history has vast implications for economic policy. Friedman won his Nobel Prize for his work associating increases in money supply with inflation. But with the benefit of hindsight, it is clear he confused cause and effect. The US, like the rest of the developed world, experienced a surge in demand in the post-War period. The reason was the unprecedented increase in the number of babies being born – and staying alive. A century ago, large numbers of babies died in their first 5 years of life. But this suddenly stopped once drinking water became safe to drink (due to the use of chlorine), and vaccines became available to protect against dangerous diseases such as tuberculosis. So as these babies grew up, they needed more and more things. Yet the wartime economy was still in recovery mode. It takes time to turn factories made to produce tanks into plants that can produce washing machines. The situation in Europe was even worse, as much of the industrial landscape was bombed out. Tpday, it is therefore obvious that the inflation from 1970 onwards was due to a surplus of demand relative to supply. Markets were doing their job, and allocating product by raising prices. What else could they do? Even when governments introduced price controls, they inevitably failed, as President Ford found with his 1976 WIN programme – Whip Inflation Now! The 1980s saw this process start to reverse as the chart shows above. 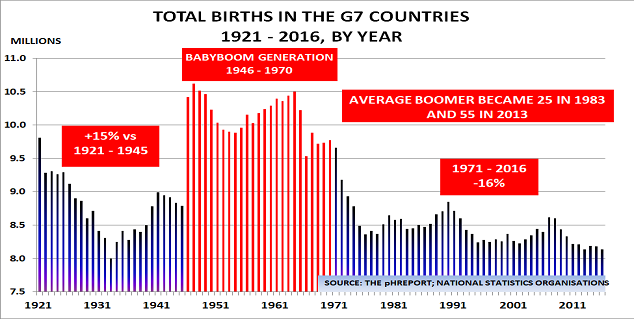 As the Boomers reached the 25-54 age range and their Wealth Creation period, so supply began to increase to meet demand. And their savings became available to further increase supply via pension fund investment in the stock market. Crucially, however, inflation meant it made sense to borrow money, as its real value then declined. And it made sense to borrow to buy the products one needed, as their cost would reduce. Thus an early MasterCard slogan to highlight the benefits of a credit card was ‘Take the Waiting out of Wanting’. Now, of course, we are living in the reverse of this world. We have relatively few people in the Wealth Creation generation. And for the first time in history, we have large and increasing numbers of people in the New Old 55 plus generation. They of course are a replacement economy, as they already own most of what they need. And their incomes are declining as they enter retirement. Policymakers thus made an critical mistake in assuming that monetary policy could boost demand and restore inflation. It is obviously unfair to blame Friedman for this, as he couldn’t have known this background. But they could, and should, have known their policies were based on a false premise. Now we are simply waiting for the catalyst to arrive that will cause deflation to become normal. And that catalyst could well be a fall in the oil price. The arrival of deflation will make people realise it is instead sensible to postpone purchases as prices will be lower in the future. They will also try to repay debt, as it will become more expensive in real terms. Policymakers’ stimulus programmes have wasted $tns by failing to recognise the obvious economic impact of today’s massive changes in demographics. The US, for example, has spent $10tn alone over the past 6 years – $6.27tn in federal deficits and $3.63tn on the Federal Reserve’s money printing programme. Now the rest of us will have to pick up the bill from their mistake.